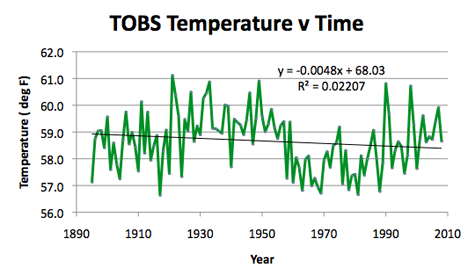 The last post in this series, on South Carolina, brought up an unexpected temperature variation that, coincidentally, was being discussed both at Real Climate and at Climate Audit. 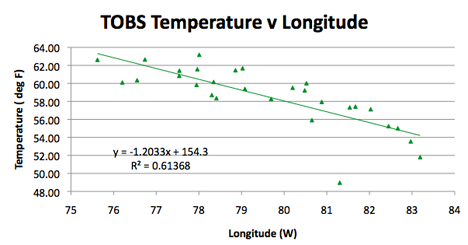 The controversy at those two sites relates to the dip in sea surface temperatures (SST's) prior to 1970, and how accurately these were measured with the controversy relating to how many ships used a thermometer stuck into a bucket to measure the temperature, and how many used a measure of the temperature made at the inlet for the engine cooling water. 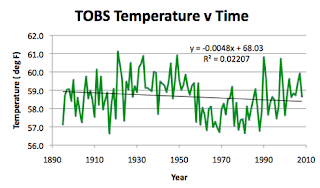 Not wishing to step into that argument at the moment, what is interesting to me is that while the temperatures in Georgia and South Carolina showed a drop in temperatures over the same period and a quick check shows some drop in Maine, and Vermont, but looking at Massachusetts it seems more that the higher temperatures of around 1950 are the aberrant ones. But these are land-based and therefore not subject to the variations based on how the water was collected and held. So we will see how this pans out for North Carolina. North Carolina has the same number of USHCN stations as South Carolina (29) but it also has four GISS stations (whereas SC had none). 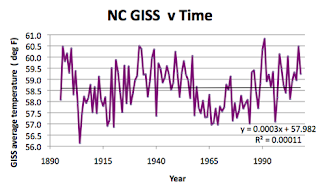 The four stations are at Asheville (with data from 1903, a complete set from Charlotte, Greensboro has only data from 1948 on, and Raleigh. The average of the GISS stations shows the same drop that occurred in the states further South. 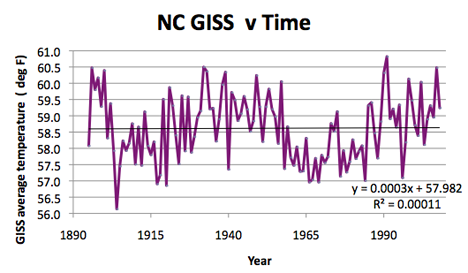 Average temperature in the state of North Carolina as a function of time, using the GISS station average. 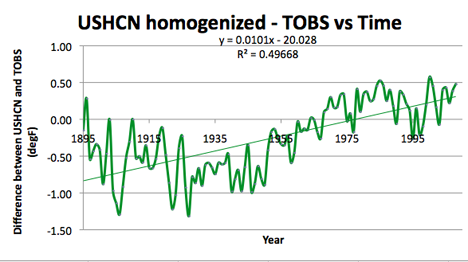 Comparing this to the homogenized data from the stations in the USHCN, the drop is found, using the larger number of stations in that set of stations. 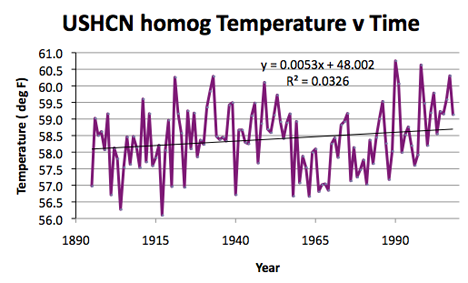 Average temperature in the state of North Carolina as a function of time, using the USHCN homogenized temperature average. 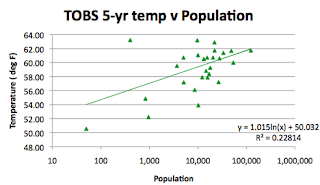 Average temperature in the state of North Carolina as a function of time, using the Time of Observation (TOBS) adjusted raw temperature average. North Carolina is some 500 miles long and 130 miles wide. 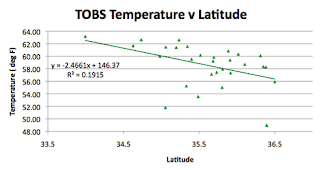 It runs from 75.5 deg W to 84.25 deg W, and from 34 deg N to 36.35 deg N. The central latitude is at 35.60 deg N. That of the GISS stations is at 35.65 deg N, while the USHCN is at 35.6 deg N. The state rises from sea level to 2,037 m, with a mean elevation of 213.4 m. The average GISS location is at 312.7 m, while that of the USHCN stations is at 260 m.
Location of the USHCN station on Cape Hatteras near Frisco. 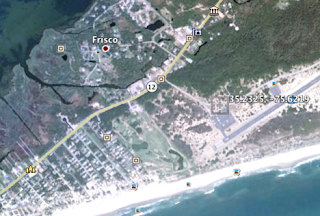 Frisco, checking with U.S. Beacon has a population of 401, though that was in 2000 and seems, from the photo, to be low. And Transou does not appear in citi-data, so I also went to Google Earth for it. Looking around I decided it should have a population of about 50, although it turns out to be relatively close to Laurel Springs (population 1,400). 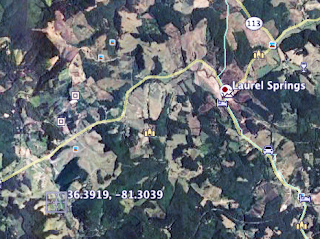 Location of Transou station in North Carolina – while there are lots of plots ready for housing development there are not a lot of houses yet. The population around the GISS stations averages 361,732, while that of the USHCN stations is 61,431. That population difference might have caused a 0.47 deg difference making the GISS temperatures higher, while the difference is actually 0.22 degrees. 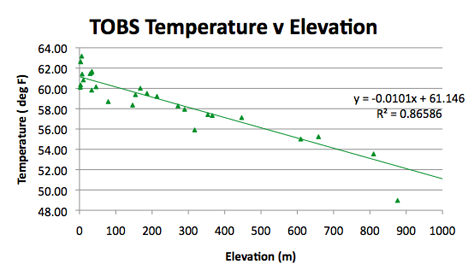 That would be more than explained (about 0.5 deg) by the difference in elevation between the two averages. However the temperature fall is more likely correlated with elevation (since it goes down on the other side of the mountains). 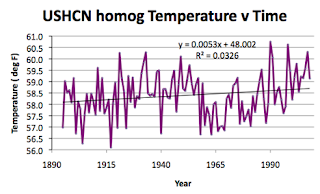 Well it seems clear that the steep drop in temperatures around 1950 occurred in North Carolina also, so does it still hold true further north? 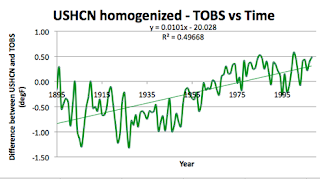 Oh, and that drop does not show up when one subtracts the TOBS data from the homogenized USHCN values, that adjustment is more linear.